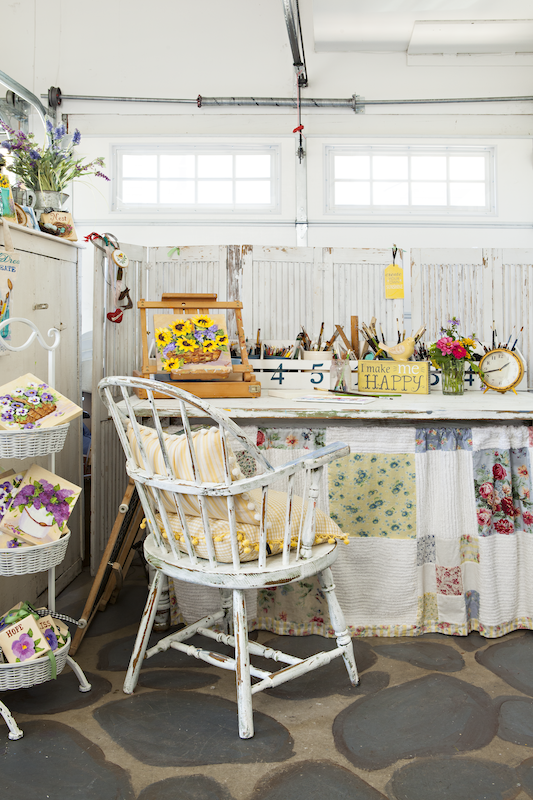 These nifty tips and tricks will help you organize your craft room while still keeping its cottage flair. Crafting is messy! 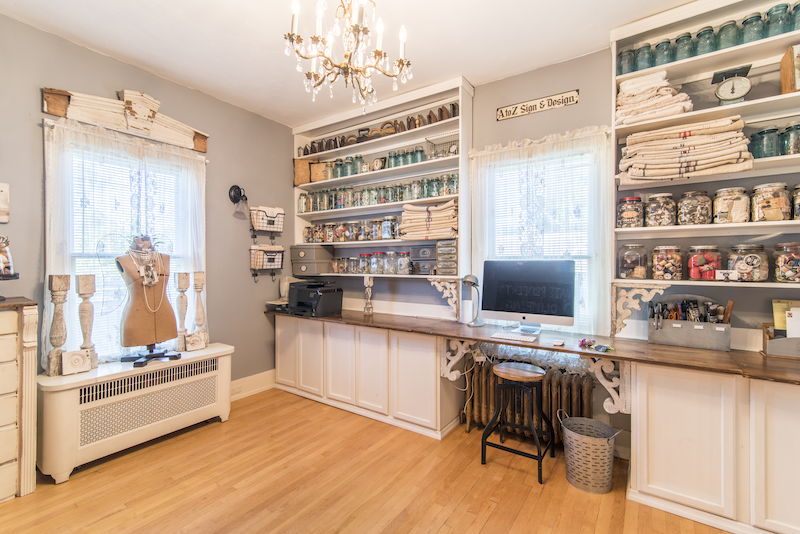 But it can be a little bit less messy if your craft room is well-organized. 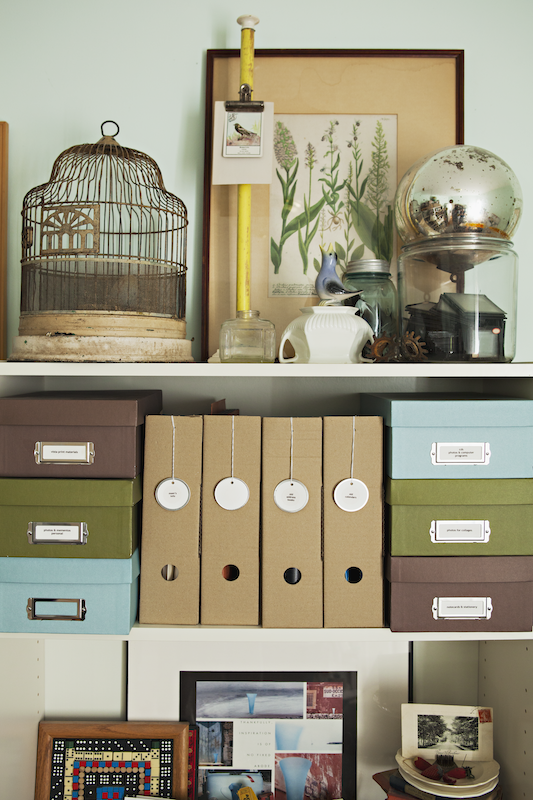 Whether you repurpose items that you already have around your home or find creative and practical storage containers at thrift shops and flea markets, these organizational tips are easy and affordable. 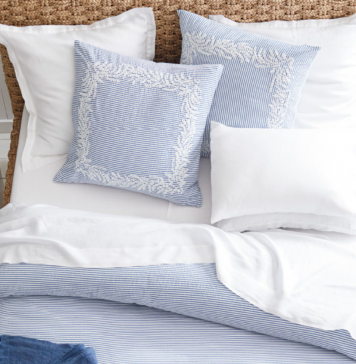 They will also look great in your cottage. 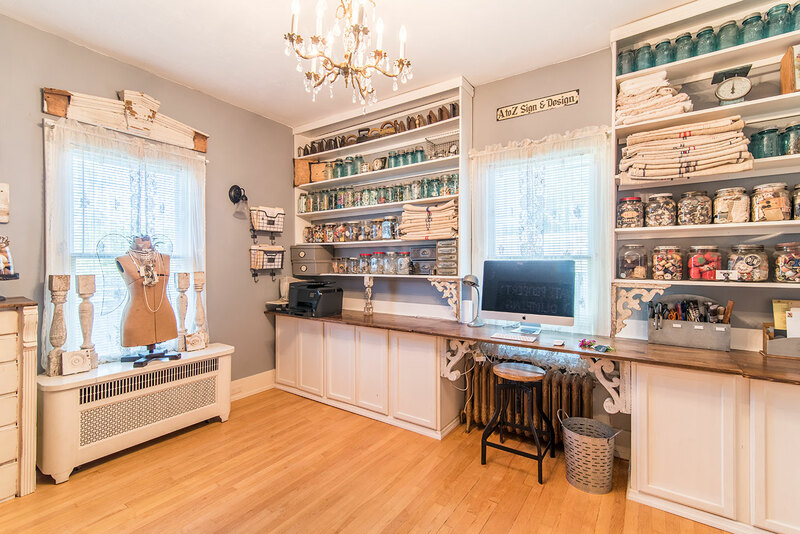 These beautiful craft rooms will inspire you to get your craft room cleaned up and looking stylish! 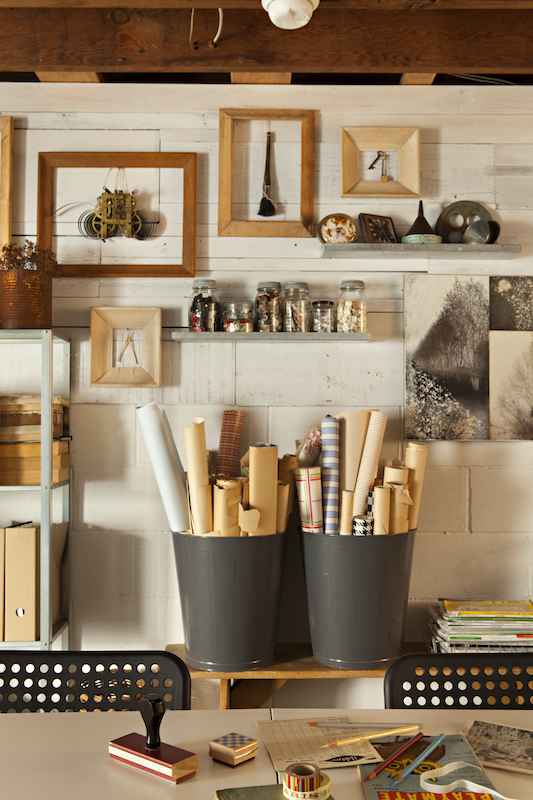 Turn any space can into a stylish craft room, even a garage which is where artist Erin Houghton set up her art studio. 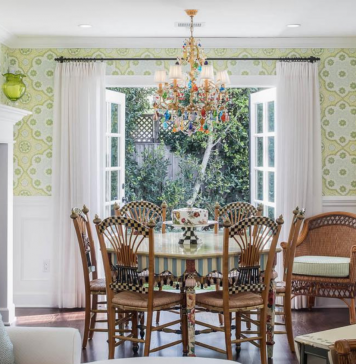 Use room dividers or hang curtains to create a designated crafting area. 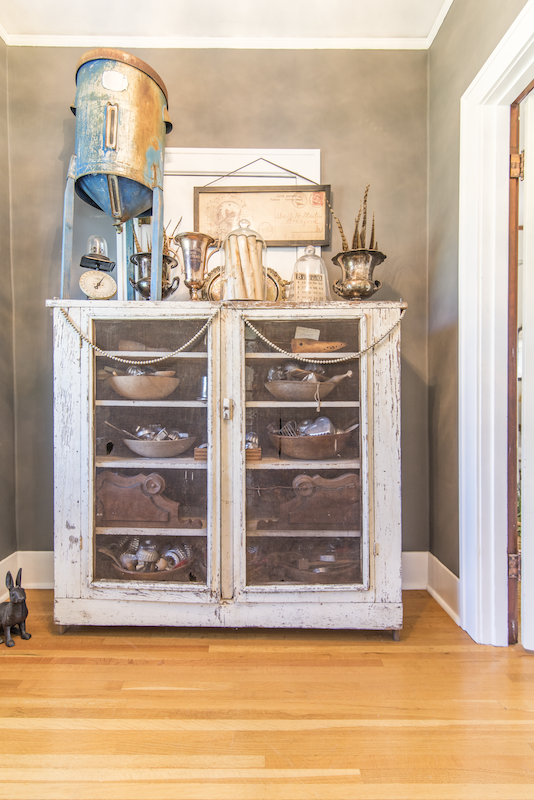 Old (but sturdy) furniture that’s no longer suited to your decor or vintage pieces found at a thrift store or flea market are great for craft rooms. Use antique bowls, trophies, vases, or platters to display and organize your crafting supplies. This will give your room a whimsically curated look, while still keeping everything in its place. Don’t be afraid to mix and match! 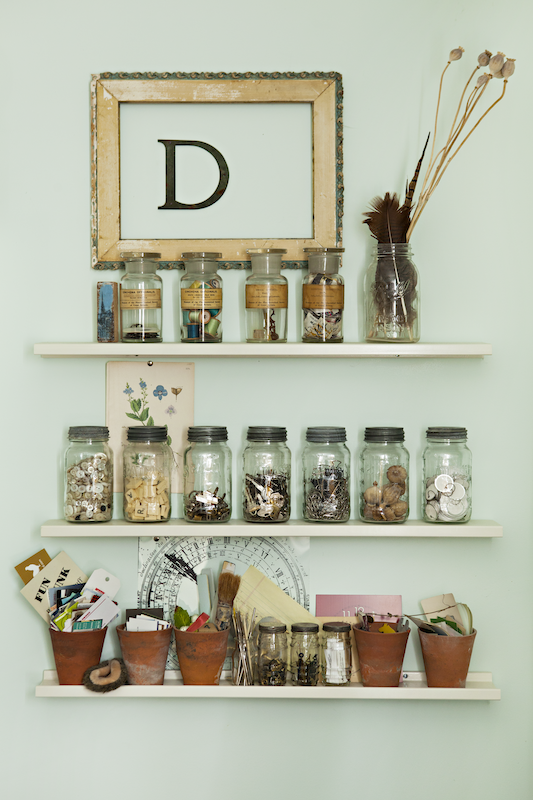 Use jars of different sizes, colors, and shapes. Use metal baskets in some places and shoebox organizers in others. Store different kinds of paper in magazine holders. 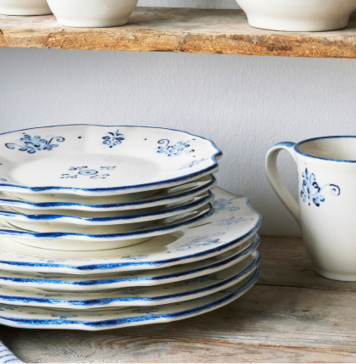 Use vintage dishes to decorate your craft room, or to hold craft supplies. Artist Amy Duncan uses old mason jars for storing buttons, paper clips, sea shells and all sorts of knick-knacks. 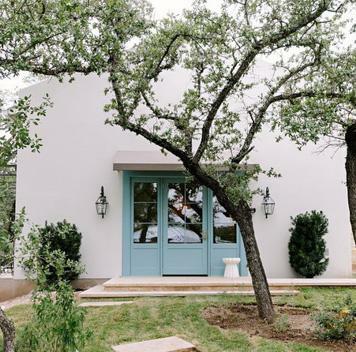 They’re clear, so you can easily see what’s inside, and they add to the cottage décor. You can also use ceramic plant pots or even repurpose clean spice jars to hold smaller items. Amy Duncan also uses garbage cans to hold tubes of wrapping paper. They’ll be easily accessible but out of the way. A quick coat of spray paint on the garbage cans can bring some color into your craft room! 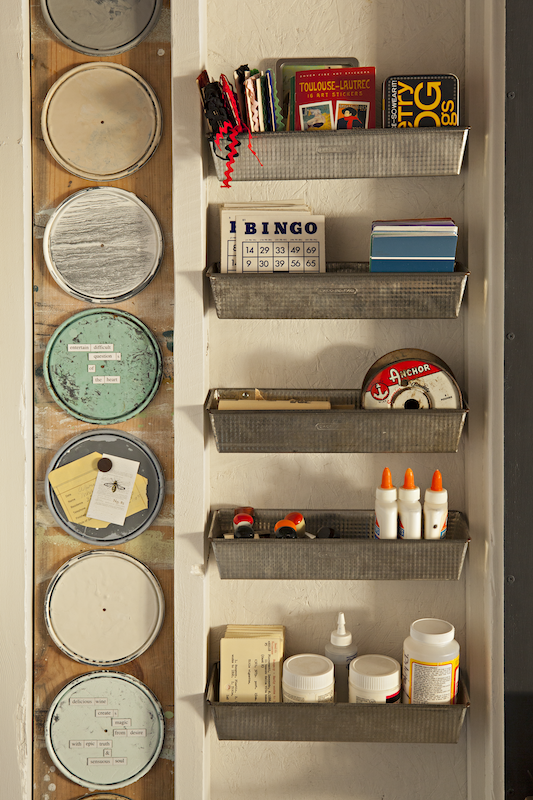 Paint can lids attached to the wall can be upcycled as small magnet boards. They’re already painted, so all you have to do is mount them on the wall! Display reminders, sketches or decorations on them. 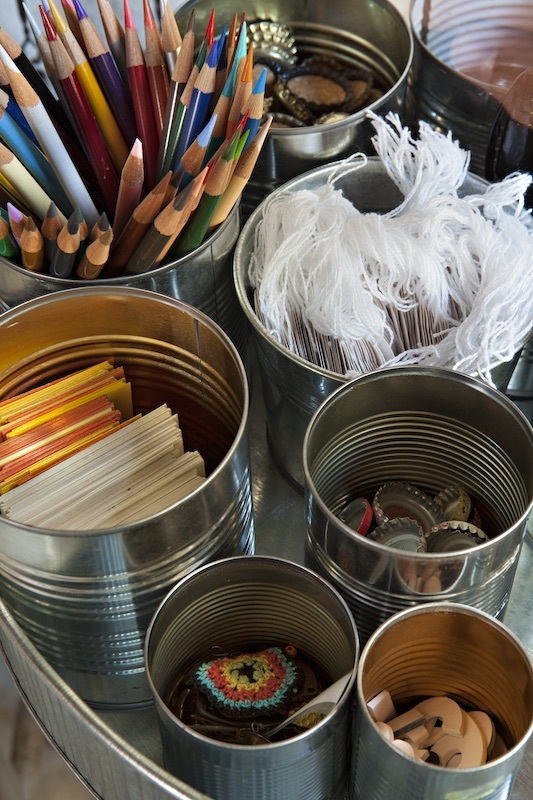 Use clean tin cans to hold pencils, buttons or paper tags. Remove labels easily by running the cans under warm water. 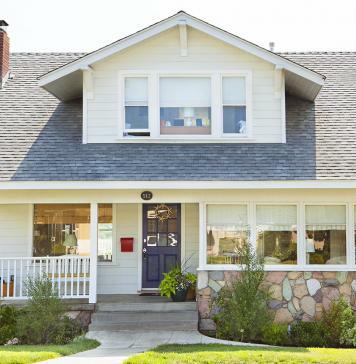 These three steps will get your house ready for the market.